I’m typing at speed today because I’m leaving for London soon with my 16 year old daughter, Kitty, to drop her off at a friend’s flat where she’ll be staying next week while she’s doing work experience. I’ll miss her! On Friday, I wrote and sent off a job application for a writer-in-residence post. I doubt I’ll get it but my philosophy these days is that I just have to try for these things. Plus, it was a perfect opportunity to update and polish my Writer’s CV which isn’t looking too shabby at all, though I say so myself. I hit the ‘Send’ button 40 minutes before the job deadline after working on the application on and off all day, in between teaching my 14 year old son, John, how to weed and water the garden (he was home from school because of a Teaching Training Day) and in between writing a micropoem for a competition also with its deadline on Friday. I doubt I’ll get anywhere there, either, but…. you know my philosophy. Once I’d sent the job application off, I realised that I’d made a glaring grammatical error in the covering letter and said to Johnny “I’ll never get the job now but at least I made the deadline.” “Don’t be ridiculous!” he said “Tell them you’ve made a mistake and send a corrected letter in, quick.” Ever been parented by one of your children? Thank goodness for the common sense of fourteen year olds. Anyway, Friday was also the day I finished writing a guest blog post for Anthony Wilson who has kindly posted it today! 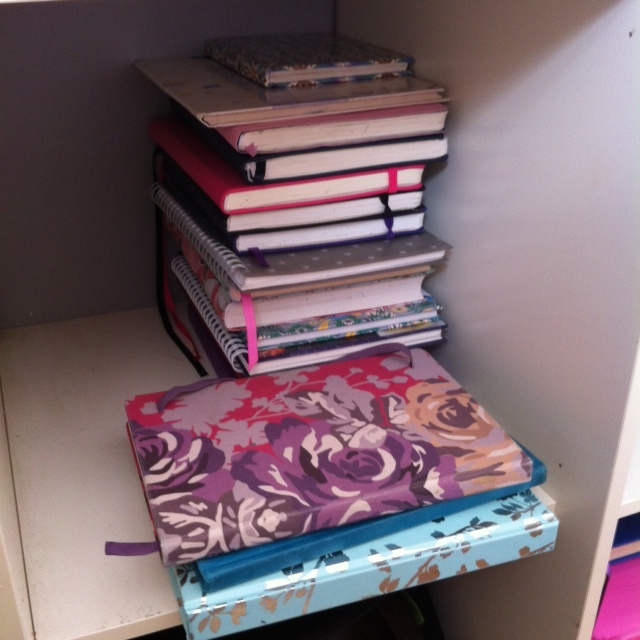 It’s basically a love letter to my diary, journal, notebook, call it what you will. I’ve been writing in one for almost the whole of my life. Thank you, Anthony, for your hospitality. You can read “Dear Diary” here. Good luck with poem and job application. You are obviously far too young to know about the twists and turns of role reversal. When my hair went white in my 60s, I looked in the mirror and saw my mother. Nowadays my children aged 50+ treat me as though I were their child. I can’t win! I know, it is fascinating how our roles reverse as we grow older. One of the joys of being around people of different ages, family or not. Thanks for the good luck wishes and for popping in to my blog! I’m beginning to follow that philosophy too myself. Thanks, David. Not a bad philosophy to have! Good luck with the job application. What a wise son you have! Thanks, Heather! He does have his moments!